Bauer will carry out improvement works at Yas Acres, Abu Dhabi. A leading provider of services, equipment and products dealing with ground and groundwater, Bauer says the scope of works include earthworks, general site clearance and the relocation of a temporary treatment plant. 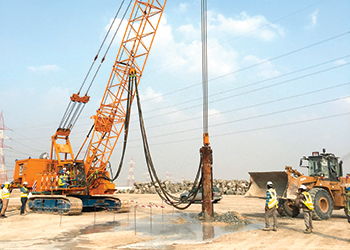 Aldar had commissioned one of its units, Bauer Geotechnical Specialised Foundation, for the early works. Bauer says its part of the work is expected to take 10 months. Not far from the famous Formula 1 race track, Bauer – which is also responsible for the design – will carry out the ground improvements for the future buildings across an area of 400,000 sq m from the end of October. The golf and waterfront development will add 1,315 high-end villas to Yas Island. It will also include retail buildings, schools, a mosque, leisure facilities and a nine-hole golf course on 638 hectares of Yas Island – one of the biggest natural islands in Abu Dhabi.